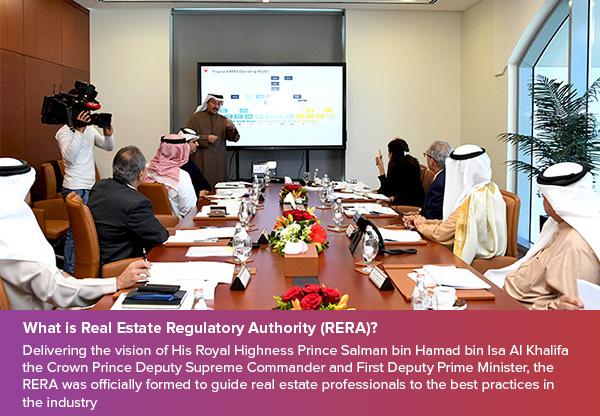 The launch of Real Estate Regulatory Authority (RERA) in the Kingdom of Bahrain will definitely create a more professional and transparent service-oriented real estate sector in Bahrain. RERA has commenced operations starting from the 1st of March 2018, where its main focus during the coming period is to provide real estate service providers and off-plan sale projects with the licenses they need to work in the field. 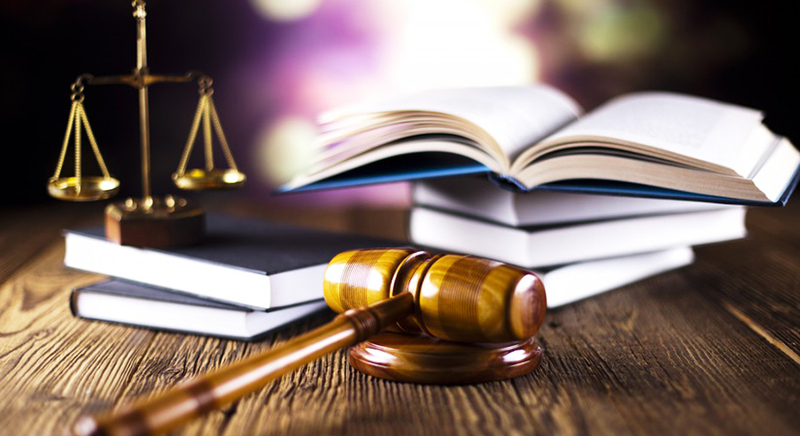 Here is all you need to know about Real Estate Regulatory Authority (RERA). What is Real Estate Regulatory Authority (RERA)? Delivering the vision of His Royal Highness Prince Salman bin Hamad bin Isa Al Khalifa the Crown Prince Deputy Supreme Commander and First Deputy Prime Minister, the RERA was officially formed to guide real estate professionals to the best practices in the industry that goes along with the international standards and compatible with the government’s National 5-year sector strategy that aims to boost the kingdom’s real estate sector, improve consumer protection and streamline real estate services in Bahrain. What is the central role of RERA? 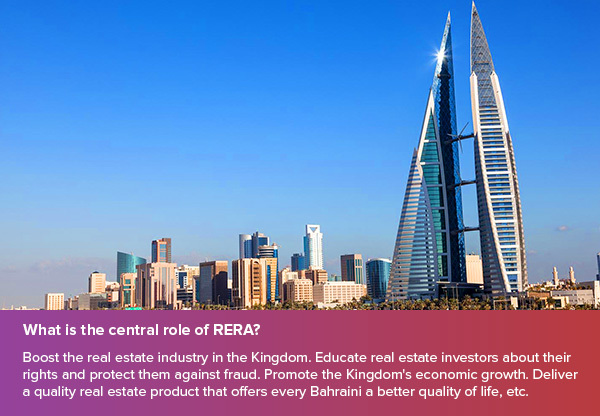 1- Boost the real estate industry in the Kingdom. 2- Educate real estate investors about their rights and protect them against fraud. 3- Promote the Kingdom’s economic growth. 4- Deliver a quality real estate product that offers every Bahraini a better quality of life. 5- Pumping effective rules and regulations to regulate the real estate market in the Kingdom in addition to facilitating real estate transactions for both workers in the field and those interested in investing in it. 6- Ensure having a transparent real estate environment that positively affects real estate investment in Bahrain and also impacts the occupier decision making. 7- Work to enrich the knowledge of professionals in the field so that they can deliver an unmatched service and excellent communication with all stakeholders. 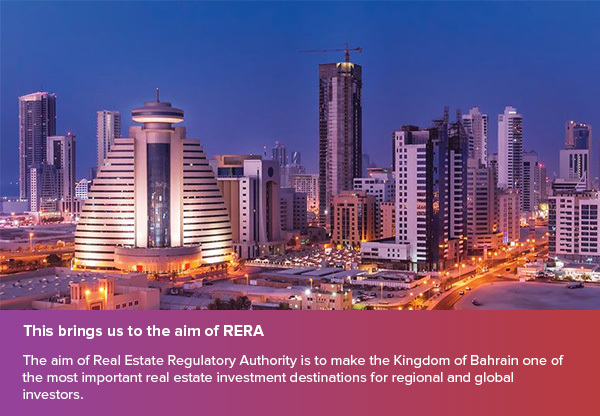 The aim of Real Estate Regulatory Authority is to make the Kingdom of Bahrain one of the most important real estate investment destinations for regional and global investors. 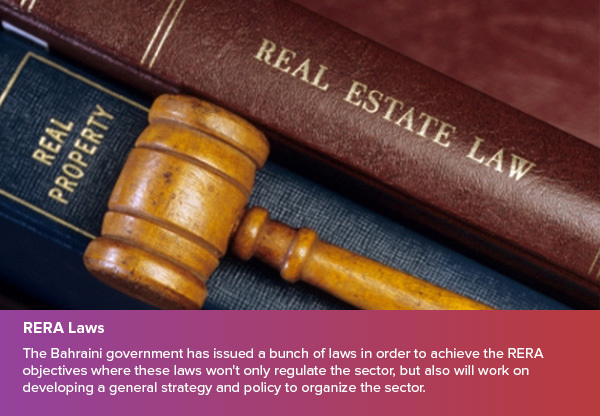 The Bahraini government has issued a bunch of laws in order to achieve the RERA objectives where these laws won’t only regulate the sector, but also will work on developing a general strategy and policy to organize the sector. According to this, these laws are mandatory for all those working in the real estate sector. 1- All those working in the real estate sector from brokers, sales agents and developers must apply and obtain a RERA license before August 31, 2018, otherwise, face penalties for non-compliance which will include license suspension or cancellation. 2- RERA is now the only entity on the Kingdom controlling the real estate sector and issuing the developer and development licenses. 3- The RERA will shortly publish a list to clarify the type of conflicts by which a developer will have to disclose if found. 4- If a developer wishes to advertise a specific project inside or outside of Bahrain, they must first obtain a license from RERA to do so. 5- Developers are allowed to obtain profits from escrow Accounts approved by RERA and the Central Bank of Bahrain provided that such amount does not affect the progress of the project and that is within 12 months from receiving that amount. 6- Small real estate projects won’t need to have a developer’s license. 7- Off-plan sales are only offered for sale when developers have a developer’s license. 8- It is a must to create an off-plan sales register at RERA, which will include all details about the project such as the number of the unit, number of floors …etc. 9- Real estate developers shall not undertake any development activity without having a license first. 10- Every development must have a development license issued by RERA. To ensure getting this license, a developer must provide the title deed or its substitute, the approved architectural and structural engineering designs, a copy of the main scheme stating the completion date, the implementation phases and any division of the project, the Building Permit, a copy of all agreements entered into by the developer, a letter from a Committee of organizing Engineering Professional Practice certified engineer providing an estimate of the value of the project, the main data related to the financing of the Project and any other information required by RERA. 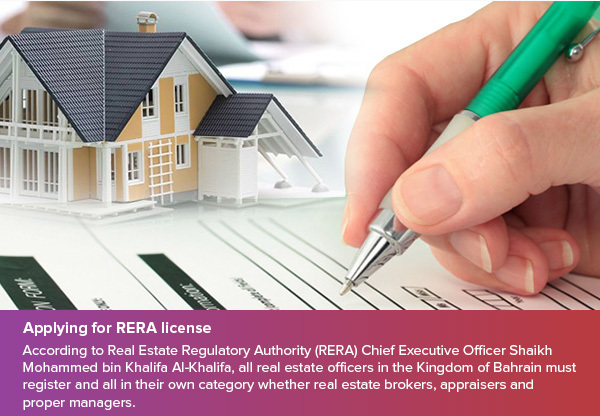 According to Real Estate Regulatory Authority (RERA) Chief Executive Officer Shaikh Mohammed bin Khalifa Al-Khalifa, all real estate officers in the Kingdom of Bahrain must register and all in their own category whether real estate brokers, appraisers and proper managers. What benefits will consumers have? 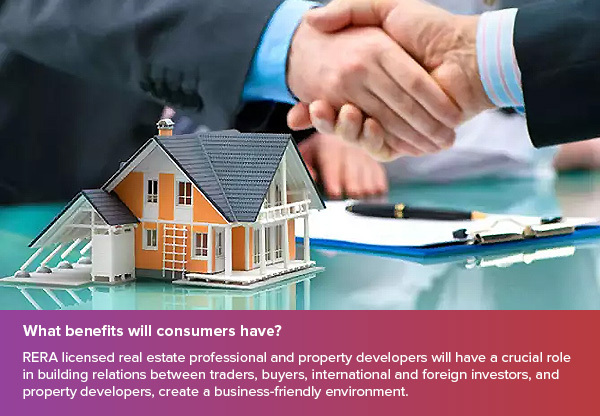 RERA licensed real estate professional and property developers will have a crucial role in building relations between traders, buyers, international and foreign investors, and property developers, create a business-friendly environment. RERA Chief Executive stressed that RERA licensed real estate professional and property developers will participate in enhancing buyers’ awareness, directing them to safe trading and advising them to purchase properties from accredited and licensed developers and projects approved by the Real Estate Regulatory Authority (RERA).